It's a very good day to be a Bruce Campbell fan. Dynamite and IDW have announced their latest comic book crossover, which will see the worlds of Army Of Darkness and Bubba Ho-Tep collide. 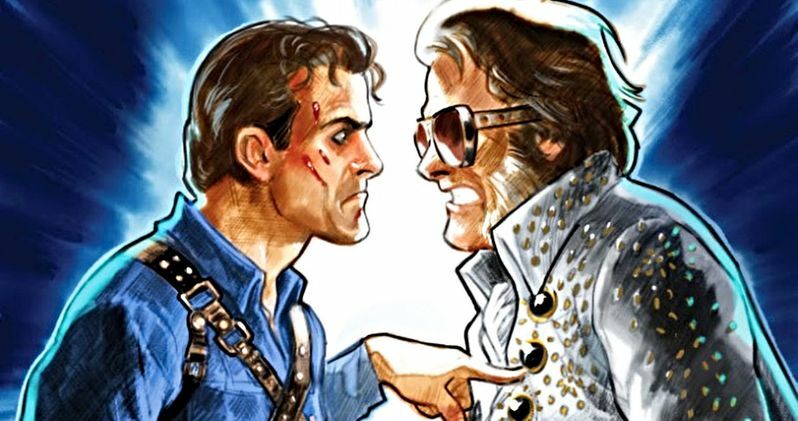 That's right; Ash Williams and Elvis Presley (the one that fights mummies) are going to meet in what sounds like the Campbell crossover of our dreams. The book, which is officially titled Army of Darkness/Bubba Ho-Tep, comes from writer Scott Duvall. The story sees Ash Williams embark on a soul-searching road trip to Texas, thinking that Elvis Presley may still be alive and kicking. This sets off a series of universe-spanning events including an Elvis jumpsuit with special time-travel abilities, a trip to 70's Vegas, where Elvis Presley was once King. The most important part? We'll be introduced to a new Book of the Dead, the Necronomicon Ho-Tep. Duvall had this to say about the upcoming crossover. "Being a huge fan of the character of Ash, and by extension, actor Bruce Campbell, I was instantly drawn to the movie Bubba Ho-Tep, based on an original story by the great Joe R. Lansdale, and starring Campbell as Elvis. Immediately upon release, I added it to my DVD collection, and I would group it with Army of Darkness because it felt like a companion piece to it. Often viewing them in close succession, I knew the Ash and Elvis team-up would go together like peanut butter and banana. These two worlds already fit so well together in tone, it made it totally plausible that they could co-exist on the same plane. Wanting to see what it would be like if Ash and Elvis interact is a big part of what sparked this, and so I'm thrilled we'll get to finally see that in these pages. " This isn't the first time either of these franchises has been expanded in the pages of a comic book. Evil Dead fans have found a lot of solace in the pages of comics over the years. In fact, the famous Ash vs. Freddy vs. Jason wound up being published that way. And IDW Comics published a Bubba Ho-Tep prequel recently. But having these characters meet? It's something that could only really happen in this medium. Bubba Ho-Tep creator and author Joe R. Lansdale had this to say in a statement. "Script and artist for the first issue of Army of Darkness vs Bubba Ho-tep are as delicious as a fried peanut butter and 'nanner sandwich. I'm as excited as if I had good sense and owned Ft. Knox. Can't wait."